Therma-flo™ - Beaumont Technologies, Inc. Evaluate the injection molding characteristics of a polymer melt using actual molding conditions. Therma-flo™ is a molding and polymer analysis method and software that measures and displays the material properties of a plastic melt in actual molding conditions. 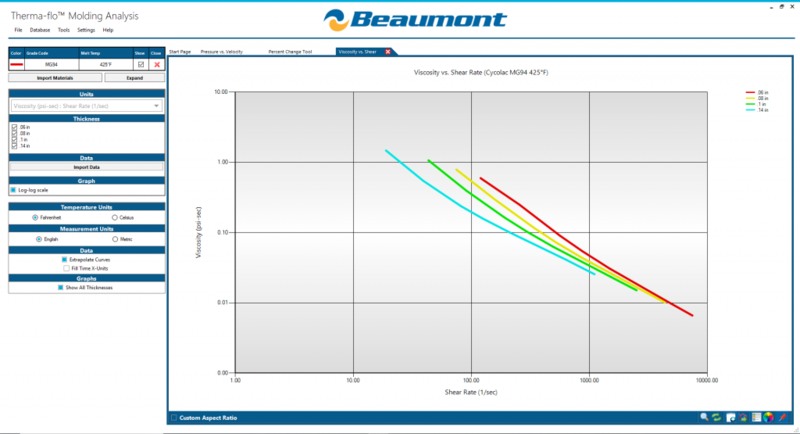 This molding and polymer analysis software uses a patented and proprietary method for mapping the actual injection molding characteristics of a polymer melt while flowing through a mold. 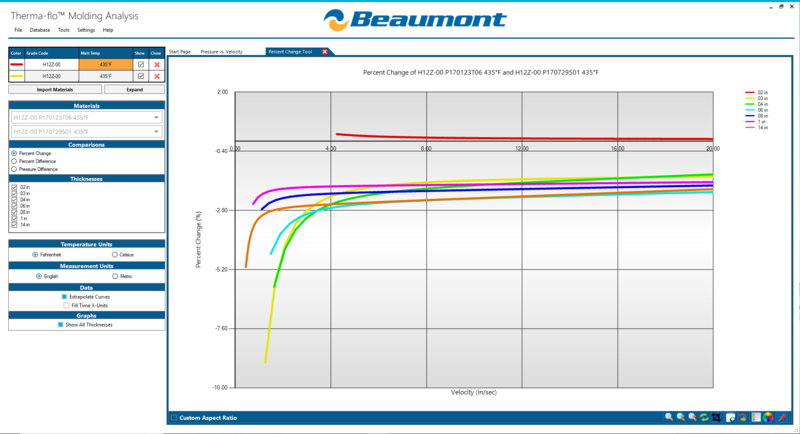 Using the latest Therma-flo 2.1 software, you can view polymer behavior in easy to understand graphical outputs. This polymer analysis is conducted using real injection molding conditions over a range of temperatures, cavity wall thicknesses, and melt flow front velocities in a cavity. Why Should You Use Therma-flo? How Does Therma-flo Capture Data? Therma-flo is part of a fully integrated test cell that includes our proprietary tooling, a high-performance injection molding machine with specially developed controls, and a high speed data-collection system. Our patented method evaluates a polymer’s flow behavior through a wide range of cavity geometries. The plastic melt is characterized through multiple molding channels at up to 10 injection rates and multiple melt temperatures. Flow velocity and melt pressures are captured directly through our highly instrumented tooling. Specialized cartridges allow characterization of thin-wall and micro-molding, high-flow materials such as LCPs, powdered metals, and we also offer a dedicated automotive analysis. You can choose your own materials or select them from Therma-flo’s database. 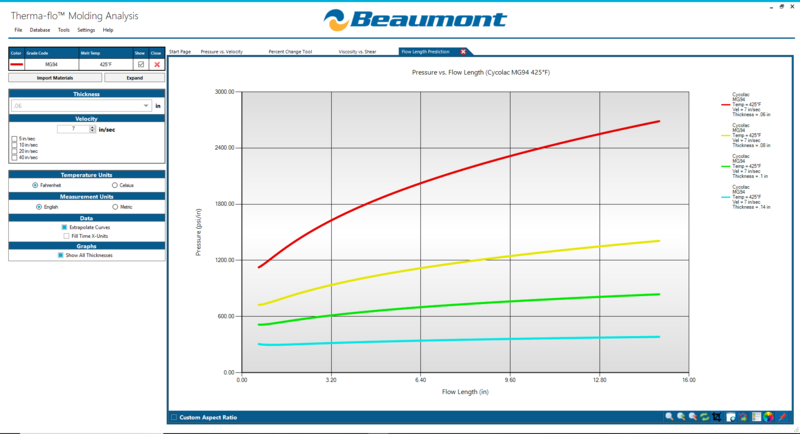 The easy to interpret graphical data allows you to evaluate the influence of melt temperature, injection rate, and wall thickness on fill pressure. Get started with your Therma-flo analysis today!